Almost half the seal pups born on the Calf of Man are feared to have died due to former Hurricane Ophelia, the Manx Wildlife Trust (MWT) said. Marine officer Lara Howe said volunteers had recorded 42 births before Monday's storm but only 22 have been accounted for since. 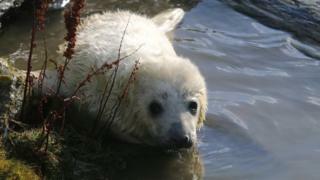 She said the loss of 48% of grey seal pups was the worst since the Trust's annual seal survey began in 2009. Mrs Howe, said: "We are all very sad - it is pretty horrendous." The worst death toll recorded previously was eight pups in 2014. The former hurricane swept through the island on Monday with 90mph (145km/h) gusts causing widespread disruption and leaving the island largely cut off. Seal pups, which weigh about 13kg (28lb) at birth and are covered in white fur, are fattened on their mother's milk and then weaned. At about three to four weeks, they lose their baby fur and are left to fend for themselves, living off fat reserves while learning to feed. The Trust is warning people to stay away from any young seals that haul themselves onto Manx beaches following the storms. Mrs Howe said: "Unless they are injured, please leave them where they are as it's very likely that their mum will be nearby even if you can't see her. "She won't approach the pup whilst people are there so please keep your distance and that includes your dogs." The number of grey seal pups on Ramsey Island off Pembrokeshire dropped by about 90 since Storm Ophelia. The seal birthing season can continue into December and one more birth has been recorded on the Calf of Man since the storms.